Integra Safety Glasses combine a single lens design with reliable performance at an economical price that will meet anyone’s budget needs. 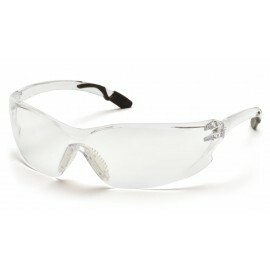 These glasses are ideal for work environment that require high impact eye protection, since it comes with a 100% scratch-resistant polycarbonate lens that exceeds ANSI Z87.1-2003 high impact requirements and is CAN/CSA Z94.3-02 certified. So what makes Integra glasses better than the rest? These glasses have replacement lenses that will extend the life of your glasses and save on added costs. Pyramex Integra Safety Glasses are available in various lens colors for various applications, including Infra Red (IR) lenses for light duty welding, brazing or cutting. For those individuals working outdoors, Integra eyewear blocks 99.9% of harmful UV-A and UV-B rays. These glasses will meet the standards required in the following industries; manufacturing, chemical processing, brazing, cutting, welding, construction, carpentry, woodworking, landscaping, agriculture, road work, auto mechanic, factory workers and more.